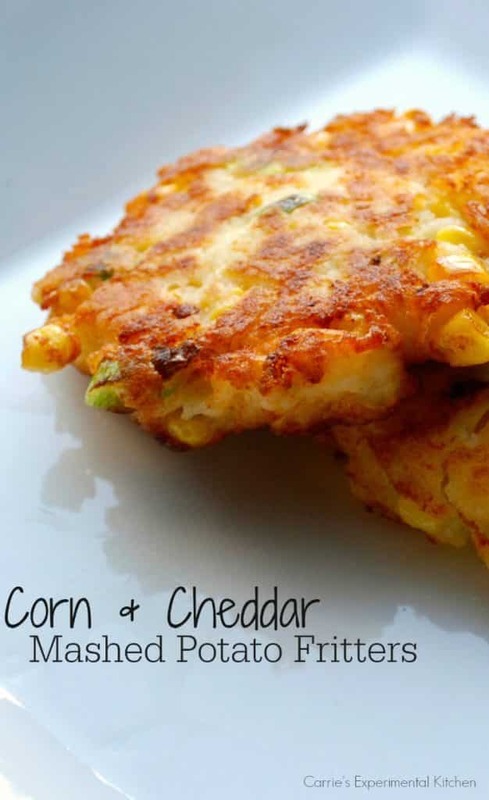 Utilize leftover corn and mashed potatoes to create a new tasty side dish with these Corn & Cheddar Mashed Potato Fritters. Sometimes the family just wants what we like to call a “stick to your ribs” meal. No experiments. No crazy vegetables or sides. Just some good old fashioned roasted roast beef or chicken with mashed potatoes and corn. But in my house, I always tend to make too much food because I’m afraid of running out so I always have leftover corn and potatoes. I decided to turn them into these Corn & Cheddar Mashed Potato Fritters to serve with another meal and I had a hit on my hands. This recipe is so simple to make and you can substitute your favorite cheese, but I chose to use shredded Cheddar. The entire process takes about 15-20 minutes and you have a tasty new side dish to serve with another meal. Start by taking your day old, leftover mashed potatoes and corn and add them to a bowl. Next, add chopped scallions, cheese, egg, flour, and baking powder. Mix well. Heat oil over medium high heat; then drop in spoonfuls of the potato mixture and brown for 2-3 minutes per side. The entire process takes about 15-20 minutes and you have a tasty new side dish to serve with another meal. 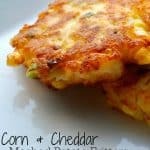 We’ve made this recipe Corn & Cheddar Mashed Potato Fritters over and over again in the years since I first posted this recipe and now my kids even tell me to make extra potatoes and corn on purpose so I can make them again. ~Enjoy! Heat oil in a non-stick frying pan over medium-high heat until it is hot. Combine all remaining ingredients in a bowl and mix well. Slowly drop rounded kitchen soup spoons into the oil and flatten the potato mixture slightly. Cook 2-3 minutes per side, allowing them to turn golden brown. Remove and drain on paper towels or brown bags to remove excess oil. Sounds delicious. 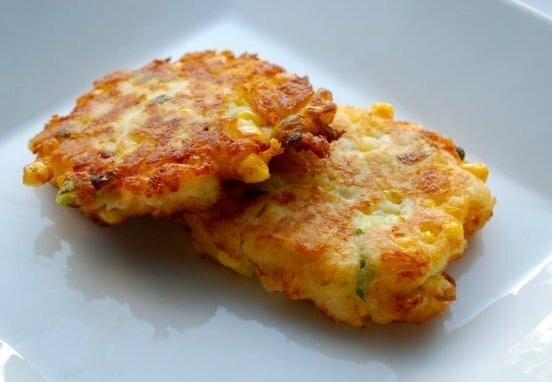 A potato cake and a corn fritter all in one! Thank you Delilah and Corey! These look and sound fantastic! Yum! Carrie, these look wonderful, will definitely be trying this soon. Pinned it! Carrie, you have my stomach growling. These look so good. Comfort! Thanks for being so faithful to link up at Weekend Potluck. I’m pinning these. Your delicious recipe has been nominated as one of the “Top 100 Best Potato Fritters Recipes on the Internet”. You can view it and vote for it here: http://potato-recipes.org/best-potato-recipes/best-potato-fritters-recipes-internet/ (position #23). What a great way to use up leftover mashed potatoes! I love the corn and scallions in these! Thank you Kristine. My youngest now asks me to make extra mashed potatoes and corn so I can make these the day after. Thanks Simon, they really are quite easy and my family loves them! I had to look it up and it is a lot like bakwan. I’ll have to try it, thanks for letting me know! My grandma taught us how to make potato pancakes many years ago, never thought to do this with them. I have to try this one day as a side. My kids aren’t huge fan of mashed potatoes, but they love these. I made these about a week ago with what I had on hand (taco shredded cheese, canned corn, no onions, & leftover instant butter & herb mashed potatoes). They were AWESOME! Super easy, smooth & creamy, & crispy. Toddler loved them…until she got a bite of corn. Oh well, can’t please everyone! Going to try a no corn version for the husband & tot soon. My mom made something similar many, many years ago (minus the corn), but as a kid I didn’t like it. Whether it was my immature taste buds or mom’s lumpy potatoes, I’m not sure. But Loved this version. (I think the leftover instant flavored potatoes worked great to make it smooth & tasty. Perhaps I’ll add a bit of left over crumbled bacon to the husband’s no corn version. Thanks for sharing!!! I never knew what do do with the leftover potatoes…now I purposefully eat a smaller portion with dinner (and who needs all those carbs in one meal anyway! hehe). 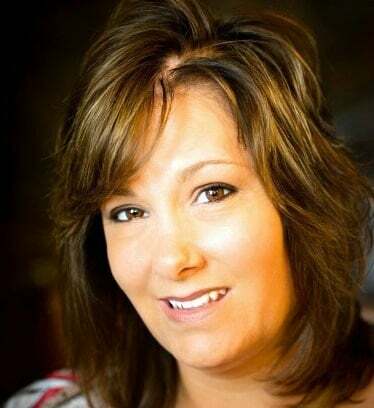 Hi Desiree, I’m so sorry the recipe didn’t work for you! I’ve made this recipe many times and never had a problem. Could you have possibly used baking soda instead of baking powder; which would cause them not to rise/puff up.